At least I can stop moving crappersonal belongings from place-to-place. Completed moving our offices to a new building a week ago, and the moving truck hauled away our Italy-bound goods on Wednesday. 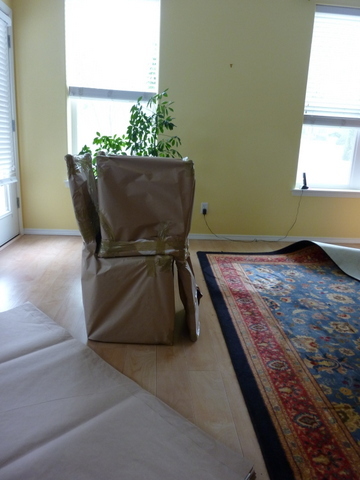 Our furniture is “mummy-wrapped” for shipment to Italy. The house is looking strange. Saturday we had a moving sale and emptied our house of virtually everything not attached. All we have is a hotel room full of luggage and two half-crazed felines. Libby explores the hotel room. Most of her time is spent under a bed. Poor kitties! They slept every night for 8 years, 3 months at 2628 NW Kennedy Court. 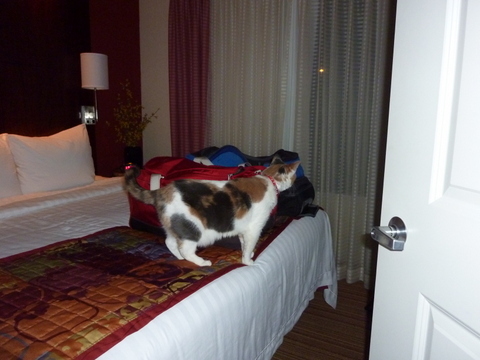 Tuesday I bundled them into their new Sherpa Pet carriers and transported them to the Residence Inn. A lovely 2 bedroom/2 bath suite, I might add, since there are four of us, a litter box, and 8 pieces (God help me!) of luggage. The cats actually have their own suitcase, a handy Rick Steves Convertible Backpack, which of course they are too small to wear, so I will carry it on for them. In fact, of four allowed carry-ons for our trip, three are pet-related and one is for us. Two of the carry-ons are the cats. Next week off to Minnesota and Nebraska for family visits. May 16: on to Rome!